Black cabinets, fixtures, and kitchen appliances are all the rage right now. Is the trend right for your home? White will always be a staple among kitchen designers and black has been an accent color. Today black cabinets are taking the focal point. This creates a sophisticated to modern yet classic look without being too traditional. This is also true in the bathroom. Not everyone wants a traditional kitchen or bathroom design and black cabinets will certainly make your kitchen or bathroom standout. Black cabinets can fit in all type of kitchen and bath designs. Matte black creates timeless and classic look while glossy black is chic, stylish and more modern. 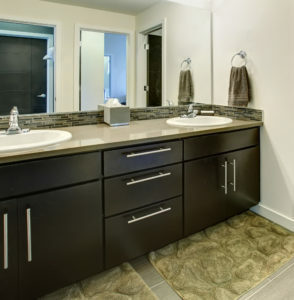 Manufacturers have increased choices in the new black fixtures such as, faucets, sinks and hardware. Appliance brands such as LG and Samsung have added black stainless appliances. The rich dark color is less susceptible to fingerprints and smudges compared to stainless steel. Also, it is easier to clean using just warm water and a soft cloth. Drop by our showroom to see what just a few of the possibilities are. 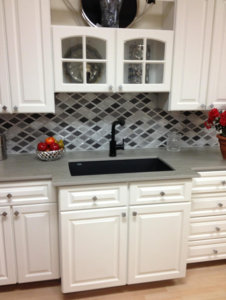 In our showroom we have on display white cabinets with a black faucet, sink and black and silver backsplash tiles. For the bathroom we show a black wrought iron stand with a deep white bowl and black wall faucet. While white cabinets will always be in style, black cabinets in the kitchen and bathroom is a trend to look out for this upcoming season. This entry was posted on Friday, July 27th, 2018 at 4:35 pm. Both comments and pings are currently closed.